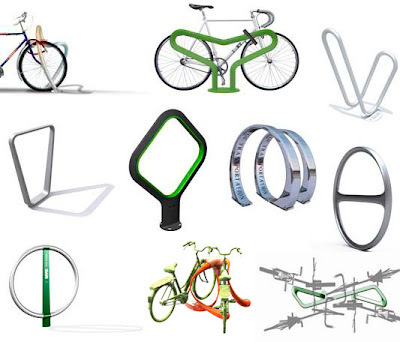 New York City has now announced the ten finalists in their bike rack competition. Thanks to Tom in Tucson for sending us the link. The competition recieved over 200 entries from 26 countries. Above is one of the finalist designs by Ian Mahaffy and Maarten De Greeve of Copenhagen. Looking at the photos of the designs, it wasn't hard to spot the Danish entry. Simple, sleek and elegant. I like that they chose a classic bike in the illustration. Sit up straight like your mother taught you. There are many cool designs in the Final 10. Many elegant forms and shapes. Apart from my biased love of the Copenhagen entry, I fancy the simple racks like Middle Row, Left and Bottom Row, Left. Personal taste. I'm wondering, however, if a bike rack competition is the right way to go. Sure, it is a positive, visual way to brand cycling in the urban landscape. Bike racks on the sidewalks are seen by all. Even better if bikes are actually attached to them. New York wishes to double the number of cyclists in the city by 2015. By all accounts they are actually doing something about it by building bike lanes and what have you. Bicycling has a high profile in the city. I don't know if chucking a lot of time and effort at bike racks is the wise thing to do at this stage. Wouldn't traffic calming initatives, more effective bike lanes, positive branding of cycling, among other things, be a better place to start? Get people to ride their bikes, achieve a certain level of success with that before the rest of it. Fair enough, a bike rack competition is a low budget affair. Installing the racks is easy and inexpensive. It gets lots of press and the results are seen by everyone on the streets. Pedestrians and motorists see them and realise that bicyling is gaining ground. That's positive. Yes, I'm having a conversation with myself. Parking for bikes is a big issue in Copenhagen. 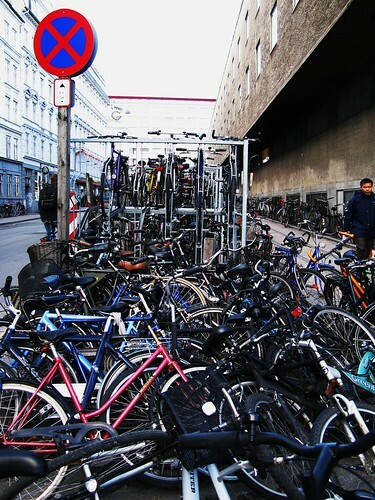 Ironically, the City of Copenhagen is now planning rackless bike racks in congested areas of the city centre. Painted zones for parking - you just use your kickstand and wheel lock - and no space-consuming racks. If you harbour a secret bike rack fetish I have a whole set on Flickr about bike racks. Most from Copenhagen and some from other European cities. 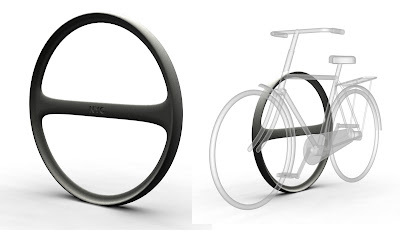 tags: "bike racks", "danish design", "new york city"